We’ve been talking about Volkswagen a lot lately, for pretty obvious reasons. And pretty often in all this talking, we’ve encountered a lot of references to VW’s past, specifically the idea that the company was “founded by Nazis. :(” How true is this statement, really? There’s no denying the role of Nazi Germany and a certain failed artist with a funny mustache had in the creation of Volkswagen. Well, maybe VW denies it a little bit, since their Volkswagen Classics department (VW corporate’s heritage collection) doesn’t include any cars prior to 1950 and they really, really don’t like talking about that era. The truth is, of course, far more complicated than “the Nazis founded Volkswagen,” because, really, that’s not exactly true. 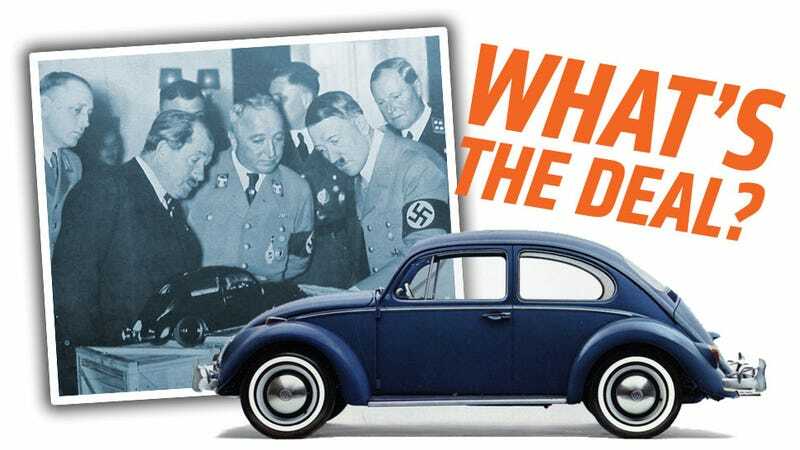 The whole history of the Beetle and the company that was created to build the car and then, after the war, sell the car all over the globe is actually quite interesting, and, really, has less to do with Hitler than you think. Also, as an aside, it should be mentioned that while VW tends to get most of the Nazi associations, they were hardly the only ones with dirty hands. It’s worth remembering that nearly every picture of Hitler in a car has him in a Mercedes-Benz. It’s also worth remembering that GM’s Opel division wasn’t shy about working for the Nazis, and that Henry Ford once received a birthday card from Hitler himself. Almost every industrialist from the leadup to World War II looks bad today. The fundamental idea behind Volkswagen, and the idea that gave the company its name, is the idea of a people’s car. A car that’s affordable and practical enough for almost everyone to own one. While it was certainly a goal of Hitler’s, this idea is far older than Nazism itself, and has been around ever since mass-produced cars came around. The curved-dash Olds might be considered to be the first major attempt to make such a car, and the Ford Model T was the first car to really become a true people’s car, starting way back in 1908. Even in Germany, the people’s car idea was well-established long before the Nazis. The very primordial Beetle-like Hanomag Kommisbrot from 1925 could easily be considered to be a people’s car, for example. Another Beetle ancestor, the Standard Superior, was even advertised using the word “volkswagen” because that word was already well-known and understood to mean an affordable small car for anybody. Basically, exactly what the Beetle would become. So, conceptually, the idea of a ‘volkswagen’ is not Hitler’s or any particular Nazi. It predates National Socialism by a good couple decades, at least. Another popular misconception that you hear often is that Adolf Hitler ‘designed’ the car that would come to be known as the VW Beetle. While Hitler did draw a couple sketches of what he thought a volkswagen should look like, those drawings do not look like the final Beetle (it really resembles a number of rear-engine designs of the era, such as the Mercedes-Benz 130H, and Hitler certainly wasn’t an automotive engineer. So this just isn’t true — Hitler did not design the Beetle. Closer to the truth, but still not entirely accurate is that Ferdinand Porsche designed the car. Porsche certainly did (with the help of Erwin Komenda for the body design) design the car that would become the VW Beetle, with the familiar final design completed by 1938. So while the particular final design was done by Porsche, that design didn’t just leap from Porsche’s fertile brains. The VW Beetle was really the culmination of a whole school of automotive thought happening in Europe — especially Germany — in the 1920s and 1930s, starting with Edmund Rumpler’s rear-engined, streamlined cars. The ideas of a backbone chassis, rear engine, air cooling, and a scarab-like, streamlined body were being explored by many people at that time. Josef Ganz, an automotive journalist and car designer, had started building prototypes of very Beetle-like cars for companies like Adler and later a production car, the Standard Superior. Ganz was a Jew, so the Nazis made sure that his input to the development of any German cars stayed unknown for years. Mercedes-Benz had their 130H and 170H rear-engine cars, Zündapp commissioned Porsche before his involvement with the Nazi government for a rear-engined, Beetle-like car, and the Czech company Tatra was designing large, powerful V8 rear-engined, air-cooled, streamlined cars — and a smaller, very Beetle-like car — that were greatly admired by Hitler and provided Porsche with a lot of, um, inspiration. Inspiration that resulted in VW paying Tatra a 1 million Deutsche Mark settlement in 1965. So, while Porsche definitely produced the final design that would become the Volkswagen, it’s more fair to say that he created a design that was heavily based on work by many other companies and designers. So how about the Volkswagen company itself, the company you can buy cars from to this day — wasn’t that created by the Nazis, at least? The answer? No, not really. See, when Hitler decided he wanted a people’s car (not his idea), and got Porsche to design it (basing it heavily on the ideas of others), he needed a factory to build it and an organization to run it. The organization was called Kraft durch Freude which sounds scary in German but is even creepier in English: Strength-through-Joy. Kraft durch Freude (KdF) was the German leisure organization, organizing tourist trips and resorts and probably prostitutes, if you knew who to ask. The people’s car was seen as a way to improve the quality of life of German citizens, and so the car was renamed the KdF-Wagen and a savings-stamp scheme was started to let people save up for a car. A whole town was built, called Stadt des KdF-Wagens bei Fallersleben, which means, “City of the KdF Car at Fallersleben.” Catchy! A huge factory was built to build the cars, barracks to house the people, and all that. So, based on this, you’re probably thinking “See, Jason, you dipshit, the Nazis directly started Volkswagen!” But wait — I’m not saying I’m not a dipshit, I’m just asking you to hear me out. Here’s the thing: under the KdF name and management, no civilian Beetles were actually ever sold. At all. A little scuffle called WWII happened and pretty much killed KdF. The factory was converted to produce the VW-derived Kubelwagens and Schwimmwagens and other military hardware. A few Beetle/KdF bodies were made, usually on beefy Kubelwagen chassis, and used as command cars, with a few other variants. But, importantly, no basic passenger cars were ever sold. After the war, the factory was a mess, but barely functional. Germany was an even worse mess, and the people of the town (soon to be renamed Wolfsburg) were desperate for food and work. It was under the British occupation that the VW factory actually started up again, under the leadership of Major Ivan Hirst. So, the first cars to be actually built for non-military use and sold (or traded) to civilians all happened after the Nazis were out of the picture. The Corps of Royal Electrical and Mechanical Engineers ran the factory from after the war until 1949, when ownership was handed over to a decidely non-Nazi German government. A former Opel guy named Heinz Nordhoff was put in charge, and that all started the juggernaut that would become the Volkswagenwerk AG that made all those Beetles and buses and Ghias and whom we’re all so cheesed-off at right now because of this whole Diesel-cheating mess. So, the company that built the TDI that our jackass note-printer in Portland decided to hassle was definitely not founded by Nazis, strictly speaking. That doesn’t mean you have to stop making Dieselgate parody videos with Hitler in them, of course.